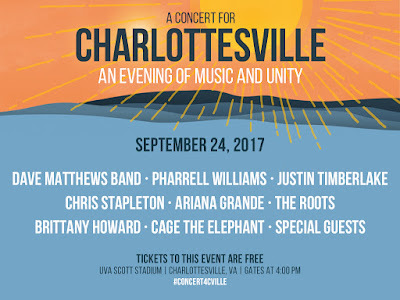 "A Concert For Charlottesville" will be livestreamed on Tumblr Sept. 24 and will feature Chris Stapleton, Dave Matthews Band, Pharrell Williams, Justin Timberlake, Ariana Grande, Alabama Shakes' Brittany Howard, The Roots, Cage the Elephant and others. All fans can tune in at musicandunity.tumblr.com beginning at 5:55 PM ET on Sunday, September 24 as well as on Huffington Post, Builder, Yahoo and AOL. TICKETING INFORMATION - The online request period is now closed. A final release of tickets will be distributed to residents of greater Charlottesville, and to UVA students, faculty and staff at the Scott Stadium West Gate ticket office starting at 8am this Saturday. Lining up prior to 8am is not prohibited. To be eligible, guests must present a UVA or valid photo ID with a current local address; there is a two ticket limit per person. While tickets are free, attendees are encouraged to make a donation to the "Concert for Charlottesville Fund" at the Charlottesville Area Community Foundation. Beneficiaries of the fund will include victims of the events in Charlottesville on August 11 and 12, their families, first responders, and organizations devoted to the promotion of healing, unity and justice locally and nationwide.